TV coverage for the USA Pro Challenge recently changed from NBC Sports to Universal Sports Network (all owned by NBCUniversal). Although the word 'sport' is in the title of both, when it comes to your cable channels, the two are totally different networks. Let's get the initial panic out of the way - yes, Phil Liggett and Paul Sherwen will be announcing the race. Jens Voigt will not, but Christian VandeVelde will be co-announcing. Although you may have feared (I mean that in the nicest way) Universal Sports Network announcers Craig Hummer, Todd Gogulski, and Dotsie Bausch to have replaced Phil & Paul - the duo are returning once again to Colorado this week for a fifth year in a row. So where can you watch the race? Q: Does my television service provider carry Universal Sports Network? A: Universal Sports is currently available through DIRECTV, DISH Network, Time Warner Cable, Verizon FiOS, and several other providers. Visit http://universalsports.com/tv-listings/channel-finder/ to find out more information. Q: I have NBC Sports Network (NBCSN) as part of my television package. Isn’t that the same thing as Universal Sports? A; NBCSN is a different television network from Universal Sports. Please contact your television provider to find out how to subscribe to Universal Sports. Q: I am having trouble watching Live Event or Full Event Replays Online? Race coverage will be Live starting at 2:00pm daily MDT. 1. Go to the race (you knew I'd say this). Finish Festivals will have large screen TVs for easy spectator viewing while waiting for the racers to cross the line. 3. Watch at your desktop, while wishing you were at the race, on Pro Challenge Tour Tracker for laptop/destop, iphone, ipad, android devices. GPS tracking, standings, Live daily coverage, recaps and replays available. 4. Watch on your desktop or laptop using your Universal Sports password login, if, you are a TV subscriber. 5. Watch stages 1-6 on Universal Sports Network, if, you have this channel as part of your TV line up. 6. Watch the last stage in Denver (Stage 7, Sunday) on your NBC Network channel. Live race coverage starting at 2:00pm MDT, with repeat broadcasting of the finish at 4:00pm. 7. In Colorado 9News Denver (KUSA) and Channel 4 will be featuring nightly recaps of the race. Stage 7 - Sunday 8/23/2015 2:00 PM (MDT) LIVE Final! Thank you to a fellow pro fan I met in 2011 at the first ever VIP tent in Steamboat Springs for alerting me to the changes in network broadcasting. Thanks Jason! These pro cycling fans are like hawks when it comes to race details. More thanks to Heather Krug, who manages Pro Challenge Media questions, for getting back to me within two minutes regarding my coverage questions. 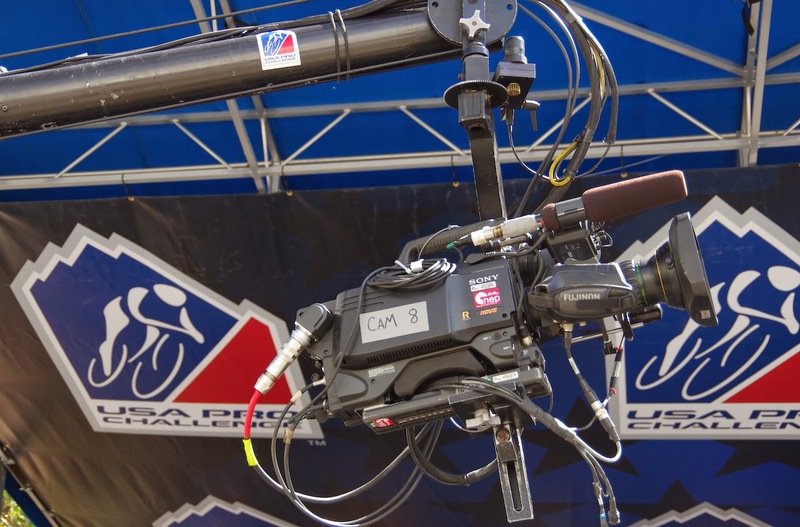 Media Coverage of the race will be provided by: Velo News, Cycling News, Steephill.TV & VeloImages, The Denver Post, 9News Denver (KUSA), Pedal Dancer® and many local newspapers.